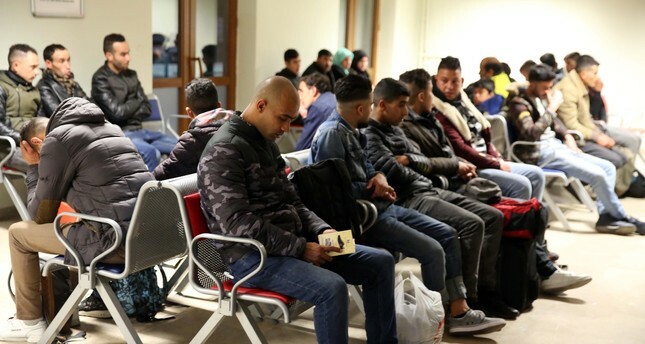 Illegal migrants wait at a migrant center they were taken to in Edirne, April 7, 2019. From highways to railroads, everywhere seems to be teeming with illegal migrants in Edirne. This northwestern province bordering Greece is a common route for migrants, but it is rare for migrants to arrive en masse to Edirne, hoping to sneak into Greece. More than 2,000 illegal migrants were intercepted by security forces in the province since April 4, and this new trend is attributed to rumors on social media accompanied with fake news that the border crossing will be opened for migrants traveling to Europe.Security forces work around the clock in areas near the border and in downtown Edirne and try to persuade migrants with the proper paperwork to go back to the cities they arrived from. Others without documents are accommodated at migrant centers in the province. Scenes in Edirne are reminiscent of another mass illegal migrant attempt four years ago when Syrian migrants heard rumors that European countries would admit more refugees. Organized on social media in groups entitled "Hope Convoy" and "Journey to Hope," migrants are boarding taxis, buses and trains to Edirne, forcing security forces to patrol all roads to the province and set up checkpoints to stop migrants. Edirne's police chief Ali Kemal Kurt told reporters yesterday that "provocative posts on social media" led to the influx of migrants. "Those people believe in rumors that Europe would open doors for migrants. We took additional measures to stop the flow and do not want anybody illegally traveling to European countries from here," he said. Kurt said they followed international guidelines to deal with the illegal migration and they "have given their all" to contain the flow of migrants. "We set up more checkpoints on the roads and are coordinating with neighboring provinces where migrants arrive to travel to Edirne. I see that our hard work paid off," Kurt said, noting that no migrant managed to travel close to the border in one week. The mass migration movement differs from the 2015 attempt as it is mostly Afghan and Iranian migrants trying to cross into Greece this time. Social media accounts in Arabic and Farsi call those in Turkey to "march to Europe from Edirne." Last week's attempt was thwarted but administrators of some online groups instructed migrants to "wait for April 15" for a second attempt. "Erect tents near the border, and we will walk to Europe if enough people come with us," one post read. Some 70 migrants holding posters of Turkish President Recep Tayyip Erdoğan and German Chancellor Angela Merkel rallied in downtown Edirne on Monday, but police were quick to disperse the crowd and send them to migrant centers. Elsewhere, drones fly above Edirne to detect migrants. Speaking to reporters on Monday, Ali Husseini, an Iranian migrant, said he fell for rumors that borders would be opened for migrants and arrived in Edirne. "They gave us instructions on where to convene in Edirne and what to do. They told us to convene at certain points and give flowers to police officers if the police come [to take the migrants]. Messages on social media told us to act calm, set up tents and wait, but we saw policemen everywhere and realized the news was a lie. I call upon others not to come to Edirne," Husseini said. Similar rumors also emerged in Greece, where police intervened when crowds of illegal migrants convened near the border with North Macedonia last week. On Monday, Bulgarian Prime Minister Boyko Borisov stated that his country's border with Turkey was ready to hold back illegal migrants, but there could be problems on the border with Greece. Borisov said Bulgaria was ready to send reinforcements to the Greek border. "Our common border with Turkey is protected well because our reciprocal agreements are being implemented," Borisov said in a statement yesterday after a meeting with Krasimir Karakachanov, the nation's defense minister, and Mladen Marinov, the interior minister. Bulgaria installed a wire fence along its 274-kilometer land border with Turkey to prevent the entrance of illegal migrants. Turkey has been the main destination for refugees trying to cross into Europe, especially since the beginning of the Syrian civil war in 2011. Every year, hundreds of thousands of migrants flee civil conflict or economic hardship in their home countries with the hope of reaching Europe. Some migrants are able to make the dangerous journey over land or sea with the assistance of smugglers, who often abandon them, especially during sea journeys, after receiving thousands of dollars from each migrant. Others are stopped by Turkish security forces before crossing the border into Europe. Coast Guard patrols in the northern Aegean Sea intercepted three groups of illegal migrants as they were heading to the Greek island of Lesbos early yesterday. No fewer than 122 Afghans and one Iranian migrant were sent to a center for migrants after they were stopped off the shores of Ayvacık, a district of Çanakkale. In the first operation, 29 migrants were discovered aboard a rubber boat around 03:00 a.m. by patrolling Coast Guard vessels. Two hours later, security forces intercepted 29 migrants off the Sivriceburnu district and at around 07:00 a.m., the Coast Guard found 45 Afghan migrants aboard a rubber boat off the İğdeliburun coast of Ayvacık. Elsewhere, gendarme forces stopped 20 Afghan nationals as they were trying to board a boat to Lesbos. The Ayvacık area of the Aegean Sea was where four migrants died last month when their boat sank. The migrants that perished, who hailed from Afghanistan and Iran, were trying to reach Lesbos, which lies about 10 miles away from Turkish shores. Last year, 25,398 people were stopped on the Aegean Sea en route to the nearby Greek islands while 65 people died when their boats sank.